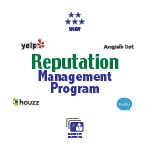 The MarketBlazer Reputation Management Program includes marketing tactics designed to build a 5-star reputation for your business. We offer three levels of participation. BeReputable is our entry level option of the Reputation Management Program and includes our 24/7 Review Monitoring solution which is constantly reviewing the Internet looking for negative or inaccurate results that can damage your good name. To view our mid level and top level offerings, please review the BeRespected and BeDistinguished options. MarketBlazer Review Monitoring system is constantly reviewing the Internet looking for negative or inaccurate results that can damage your good name. Working 24 hours a day, 7 days a week, 365 days a year, our review monitoring system collects both positive and negative reviews across dozens of review sites looking for customer reviews about your business. Any time a review is found online about your business our system alerts you immediately.